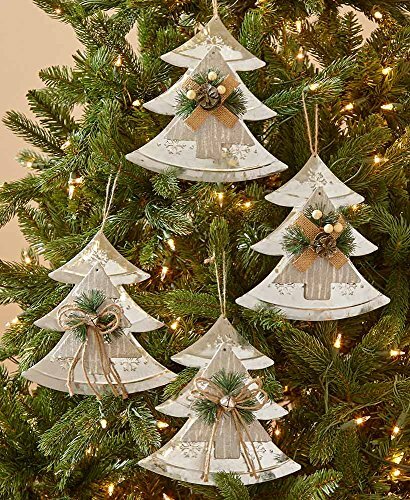 This Set of 4 Farmhouse Country Christmas Oversized Ornaments give your holiday a down-home look with a modern touch. The Set of 4 Oversized Ornaments have a galvanized finish with faux pine and a rope hanger. Their large size and seasonal accents lend a handcrafted look to your decor. Tree, 7-3/4"W x 1-3/4"D x 7-7/8"H, each. Metal, plastic and jute.